I wanted to make something special for my girls that they could use for school this year. 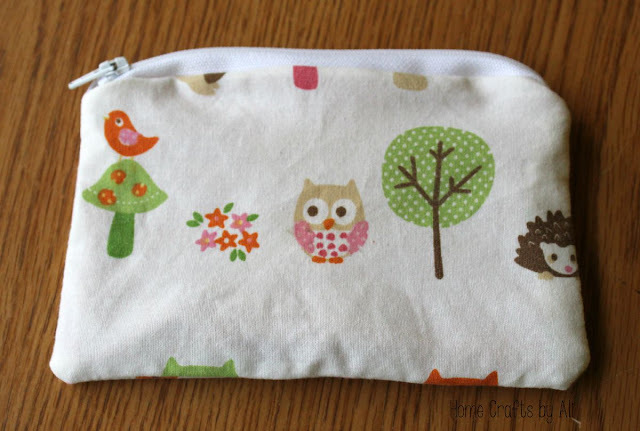 I decided to sew this pencil pouch for them. It will be a fun back-to-school gift for them. I'm pretty sure that my older daughter will ask for another one to hold her art supplies separately. I have mentioned before that my girls call my fabric stash a "mini JoAnn's". 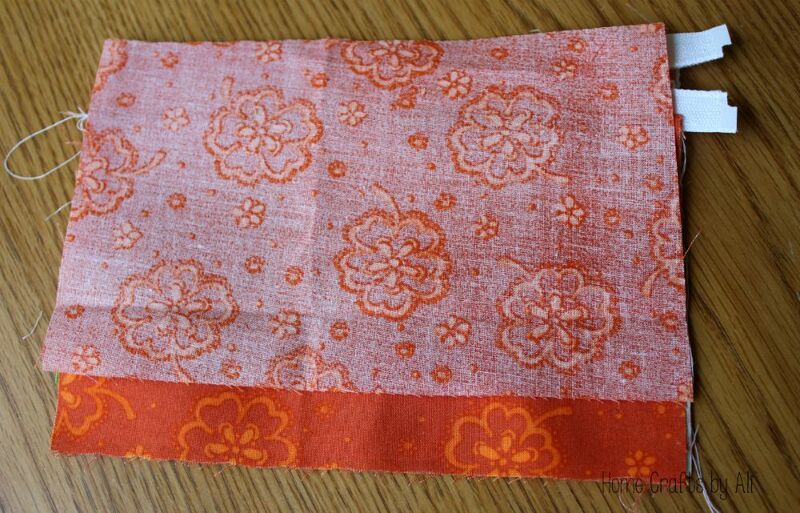 I looked through the different patterns and colors and decided to use the bright orange with a flower pattern for the liner. The animal print that I used for the outer fabric was actually a twin flat sheet that I bought at the thrift store quite a while ago. I loved the pattern and knew that I would be able to use it for something fun. I had a 7" zipper, but I think next time I make this I will buy a 10" zipper instead. The best size would be an 8 or 9 inch zipper, but I couldn't find any in that size. I cut my fabric to be 6 1/2 inch by 5 inches. You want to make sure that your fabric is shorter in length than your zipper. 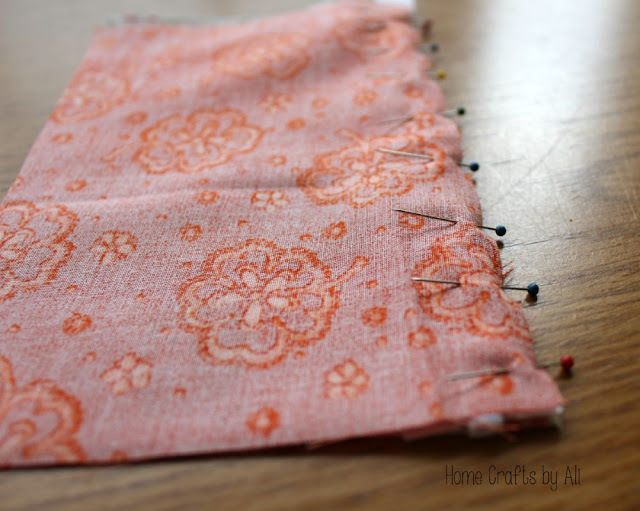 You start by placing your outer fabric on your surface with the pattern face-up. Place the zipper down facing the fabric. Line up the edges. 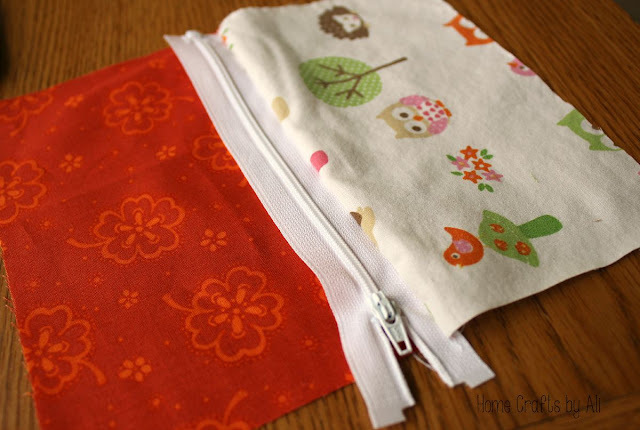 Place the liner fabric on top of the zipper with the pattern facing down. Pin the three layers together, then sew along the edge using your zipper foot. 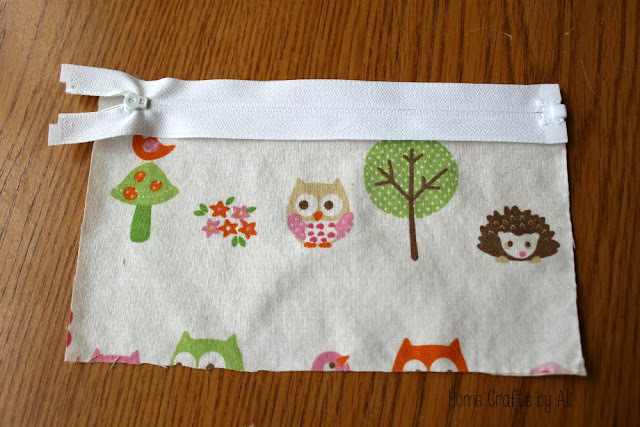 To make it easier to sew around the zipper pull, unzip it halfway. You can sew the first section, then re-zip the zipper back to the top so it isn't in the way while you continue to sew along the rest of the edge. This is what it looks like with one part done. I unfolded it and ironed the seam flat where the fabric attaches to the zipper. 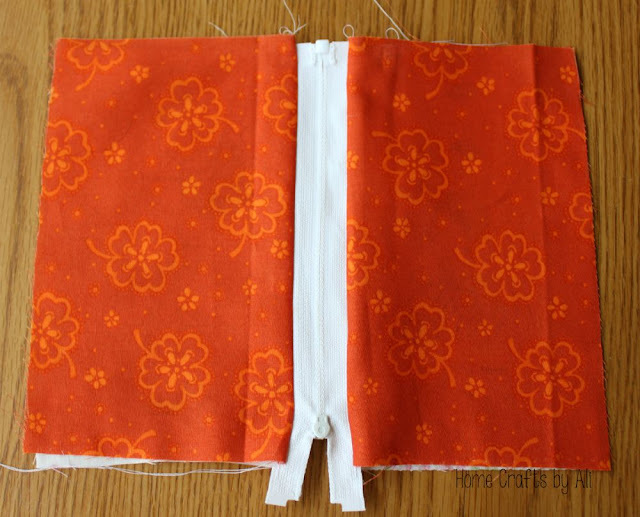 To add the fabric for the second side, place the outer layer face side up (like you did with the first side). Then place the zipper down on top of the fabric, with the zipper facing the fabric (both outer fabrics will be facing each other). Line up the edges to make sure it is straight. Place the liner fabric face down on the zipper. It will look like this when you are ready to pin it. 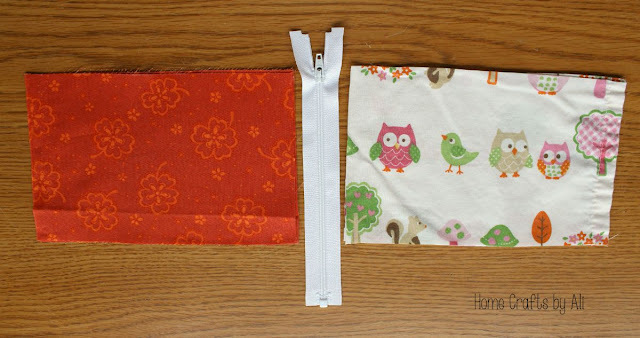 After pinning, remember to unzip the zipper part way to make sewing easier. When you are done sewing along the edge, your project will look like this. The outer fabric will be on each side of the zipper when the zip part is on top. When you turn it over, this is what it look like. 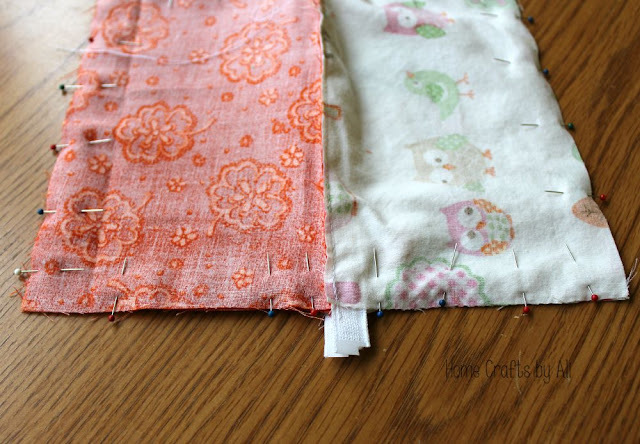 Next you will be sewing the outer fabric together and the liner fabric together. You hold the pieces of the outer fabric together (patterned side facing each other) and pin them. Unzip the zipper halfway. That will leave the opening so you can pull the fabric through later to make it right side out. Then you repeat with the liner side. When pinning the liner size you leave a 2 inch gap so you can make it right side out. I left my gap on the side of the project instead of the bottom so it wouldn't be as noticeable when you sew it later on. 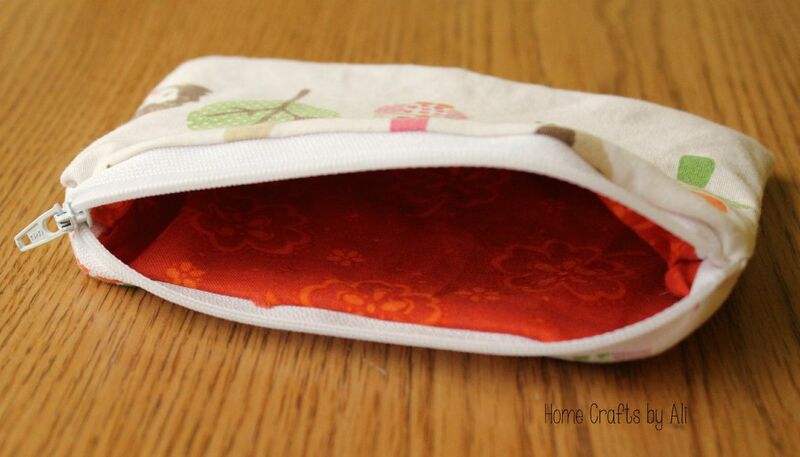 I started sewing on the side of the liner where I put a pin to mark where the gap would start. I then worked my way around the whole project until I got to the pin where I knew to stop so there was a 2 inch space left in the project. You sew over the zipper too. 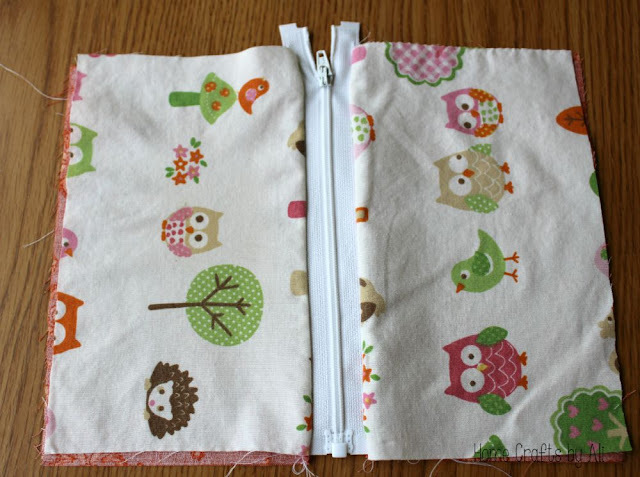 When done sewing, you will need to trim the extra zipper area. You then pull the fabric right side out through the opening you left. You will need to use your finger in the corners to make them stand out. 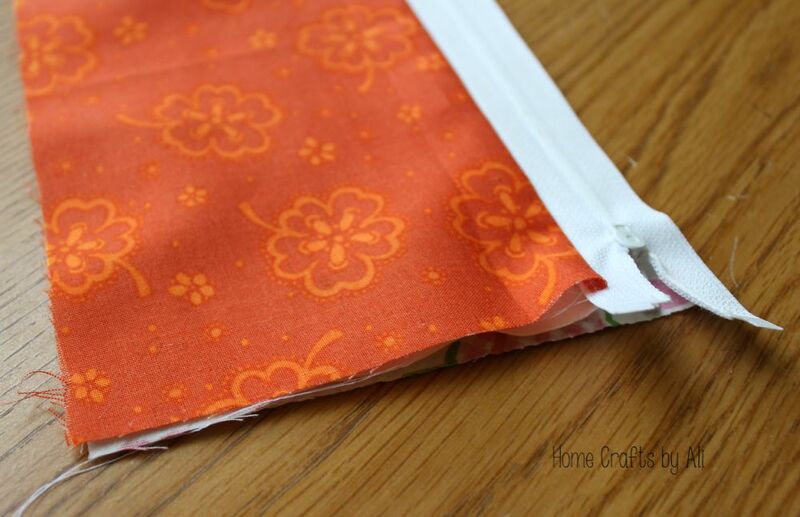 To close the gap, you can either hand stitch the opening to close it with an invisible stitch, or you can use your sewing machine. 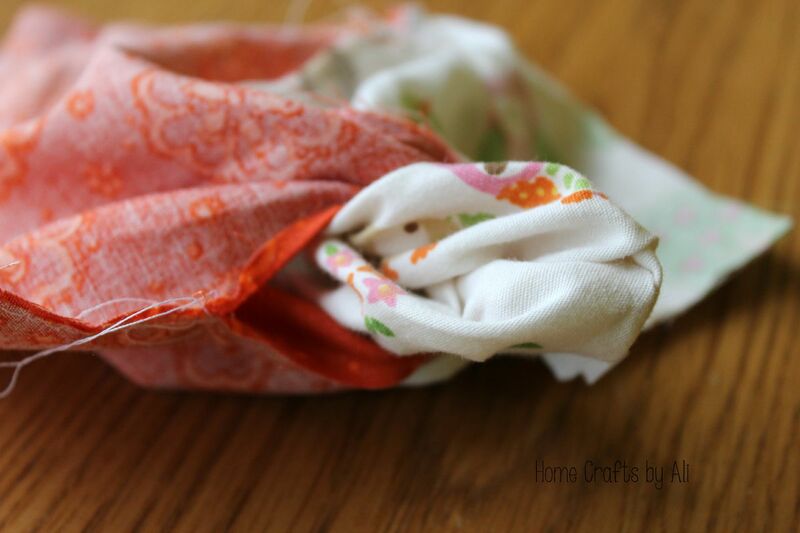 Make sure the thread is a color similar to your liner fabric so the stitch color does not stand out. 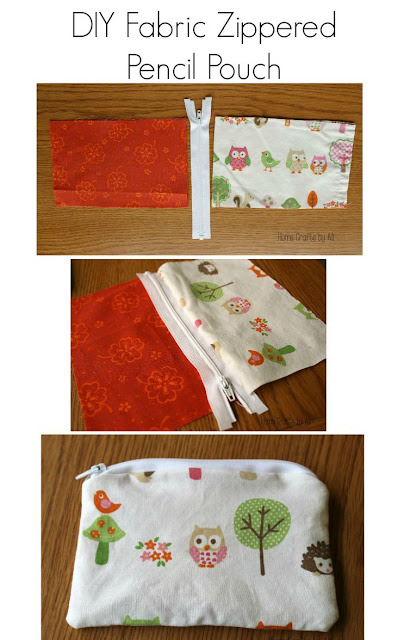 Put the lining back into the pouch and you are finished! It is ready for you to fill up with pencils, pens, colored pencils, markers and erasers. I wanted to make sure you saw that there was enough room inside for the pencils. 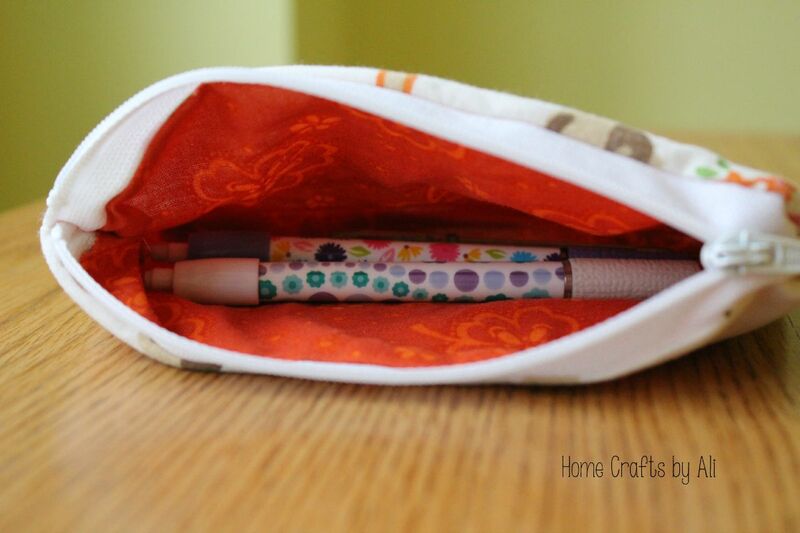 The mechanical pencils fit just perfectly inside this pouch. 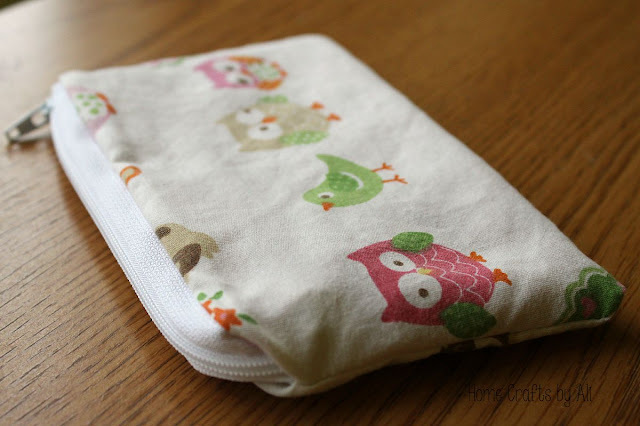 These little bags would be perfect to carry as a make-up bag when traveling also. To celebrate back-to-school time, a group of my blogging friends and I decided that we would share each others posts. 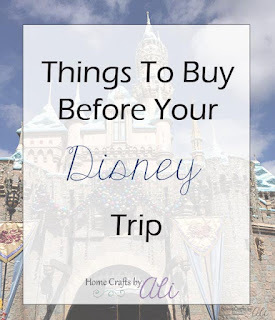 You can visit the links below to find some great information and tips! A few of them are doing a giveaway also, so definitely visit and enter! Don't forget to check out my Back to School Interview Page Printable too! Love this! I have such a problem sewing zippers so I'm always impressed when other people's projects turn out as awesome as yours did! Also, I love that fabric. Thanks Teresa! It was my first time working with a zipper, so I was pretty nervous. It turned out pretty nice and I think with more practice it will go better. This is so cool! I have a sewing machine but have not touched it since the days of 4H. Thanks Kim! I am by no means an expert at sewing. I do basic straight lines and nothing fancy. This was the most complicated project I have tried. I'm thinking of having my kids start 4H. I would love to hear your thoughts on if it's a good program. 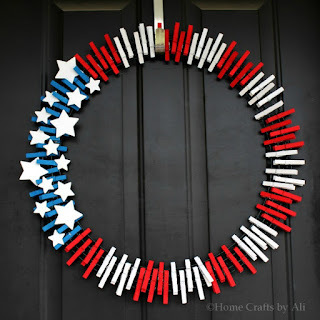 I'll be sharing this idea with my mother in law because I think it would be a great craft for her and my daughter to make together. Sadly, I can hardly sew a button. (This does look like maybe something I could handle though). Love the useful idea! Such a cute idea and so simply to make. You give wonderful instructions. I will pass it on! What a great sewing project for back-to-school! Thanks for linking up to Blogger Brags. I have pinned your post to the BB pinterest board. 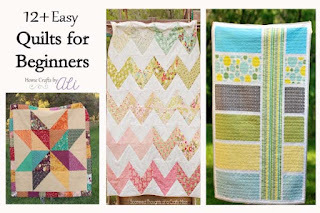 Thank you for featuring my project on Bloggers Brags this week! Thanks Christie! It was my first project with a zipper and I was pretty nervous. I love how it turned out. I will definitely stop by your new party this week!! 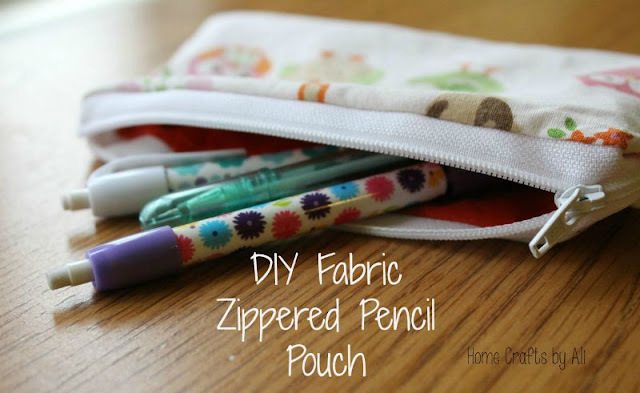 Ooooh, I have been putting off sewing with zippers but now I think that maybe, just maybe, I can do it- thank you for posting this! 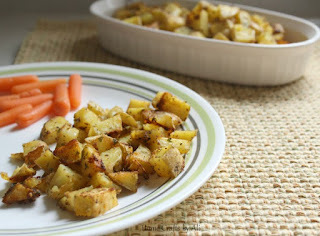 And thank you for linking up at Snickerdoodle Sunday- hope to see your latest makes tomorrow! It was my first time working with a zipper and I'll be honest, I was a little scared. It turned out really well though and I'm looking forward to making more of these. Thanks Kimberly! I'll see you again on Monday at your fun party. I got a lot of small zippers and didn't know what to make with them. The zippers would be great to use for this DIY project thanks.